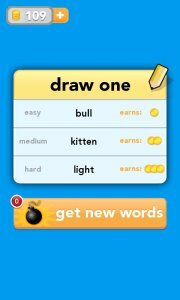 Disclaimer: I don’t have an iPhone, so I can’t confirm whether these work on its version of Draw Something. Exit the game and start it again for the following:* Get new words without using a bomb. This works even if you’re in the process of drawing something. * Watch your friend draw from the beginning. * Hide your guesses if you haven’t guessed correctly, yet. * Get new letters from which to use to guess the picture. * You can start guessing at any time. * You get unlimited tries. * You can shuffle the letters by tapping the crossing double arrow on the right, just above the letters. * If you are just not getting it, tap “Pass” in the top right corner. This will end your streak. * You can take back all of your letters by tapping the circular single arrow on the opposite side from shuffle icon. * You can either tap the letter to place it in the next empty guess slot or drag it to whichever guess slot you want. You can even drag letters from guess slot to guess slot. 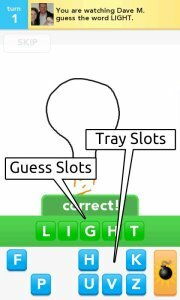 Tapping guess slot letters puts them back into the tray in the first empty slot. * If you’re stumped, just make words that fit the available guess slots until you figure it out or accidentally get it right. * The drawing scrolls vertically (up and down). 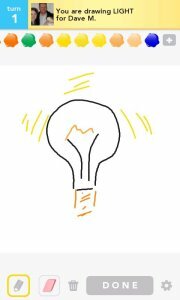 * You can watch the whole drawing if you don’t guess correctly until your friend is done drawing, guessing correctly stops the drawing and skips to the end. 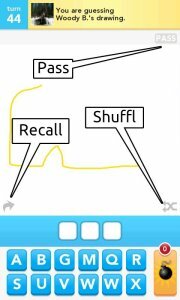 Drawing:* Don’t be too abstract, the point of the game is for your “opponent” to guess correctly. * If you need more colors, tap the [+] to the right of the color bar. * The color bar scrolls horizontally (left and right).